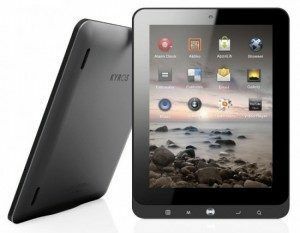 If you purchased a COBY KYROS Tablet and it is behaving sluggishly or you forgot the lock pattern, you may have to reset Android to solve your situation. Coby released an official method to reset Android in cases where the Android operating system is working wrongly or even blocked out by a forgotten pattern password. This will also add the traditional option of restoring into factory defaults through the settings menu, in caso you still got a working Coby Kyros tablet. Before starting the Android reset process you should be aware that all your personal files and settings will be lost. Therefore, if you still have access to the Android Operative system, you can do a backup with any backup tool, which you will find on your favorite internet market store tool. Turn off the tablet as follows: Press (and keep pressed) the power button until the DEVICE OPTION menu appears. Select POWER OFF and click on OK. When your Coby Kyros tablet is fully OFF, press the BACK and POWER buttons at the same time for eight seconds aprox. If you did it right you will see a android with a yellow triangle. Press the BACK button once. The hidden Android Recovery menu will appear onscreen. With the HOME and MENU buttons you will be able to move up and down among the available options. This method to reset Android on your Coby Kyros is applied from the settings menu: Settings> Backup and Restore > Factory Data Reset > Clear data , wait a few minutes the process automatically restarts your device. If you need aditional information on the COBY KYROS Tablet reset procedures, please contact us through the comments section below.